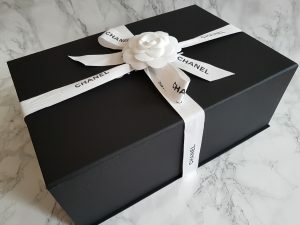 I’ve never really considered Chanel bags to be my taste before as their classic double flaps (in jumbo and the popular medium/large size) look too dressy for my casual lifestyle. 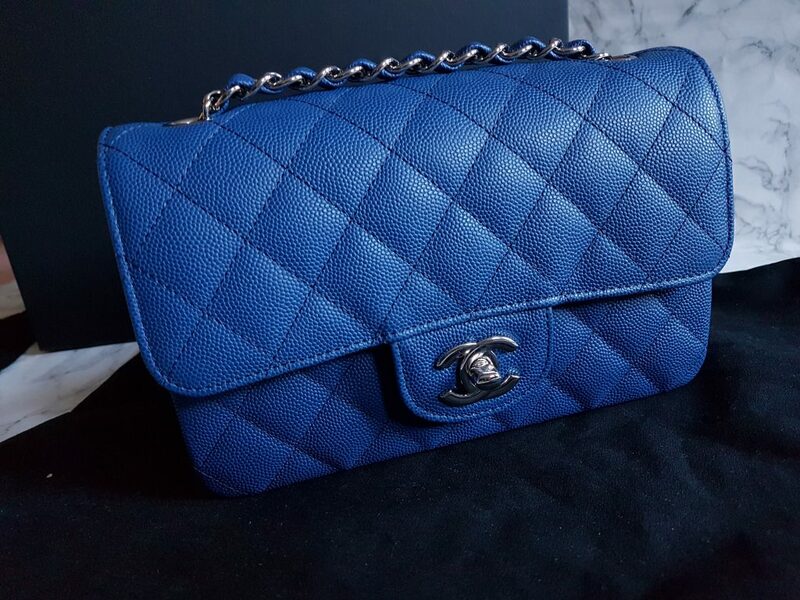 I’ve heard they can be quite heavy (which is a big put-off for me) and also the price for them is just insane for a bag I would only use on special occasions. I’m also not a fan of the louder designs which sport the huge ‘CC’ logo and prefer small and subtle. 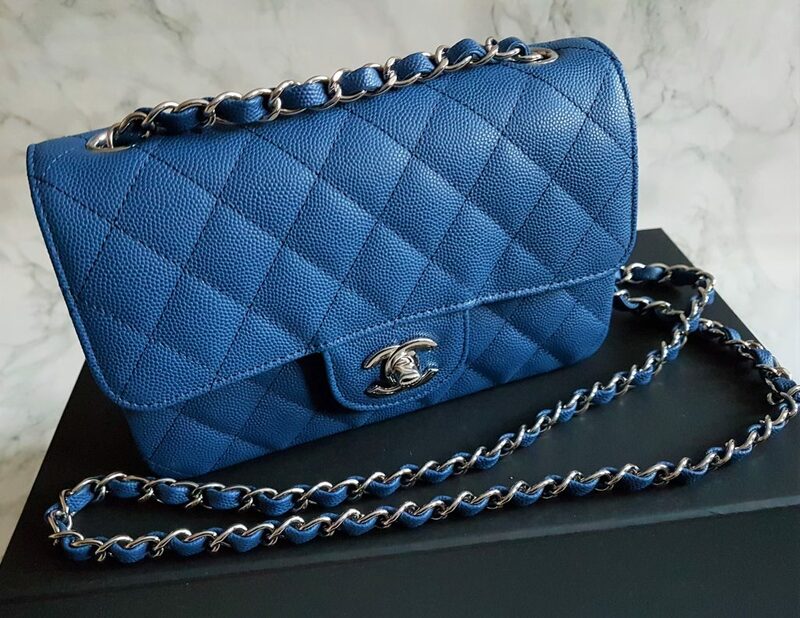 Then I came across the Chanel rectangle mini flap in the dark blue for the 2018 Cruise Collection and it just called to me! Most people love black bags because it’s safe, neutral and goes with everything. Blue for me, is what black is to everyone else and my absolute favourite colour. 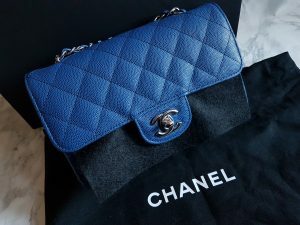 I can’t resist a beautiful blue bag and even though I feel I should get more black since it’s so versatile (and I have more colour bags than black ones), I ultimately shy away because I don’t find them as appealing. In addition to the colour, I thought the size was super cute and perfect. The mini looks more casual than the classic medium/large so that was really appealing for me. 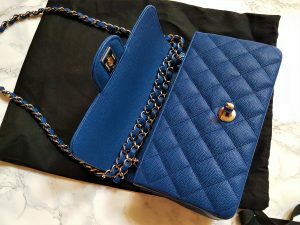 I’ve also typically gone for medium size bags in the past since I tend to carry a lot, but after getting the LV pochette metis, found I really enjoy the convenience of having something much smaller and more compact. 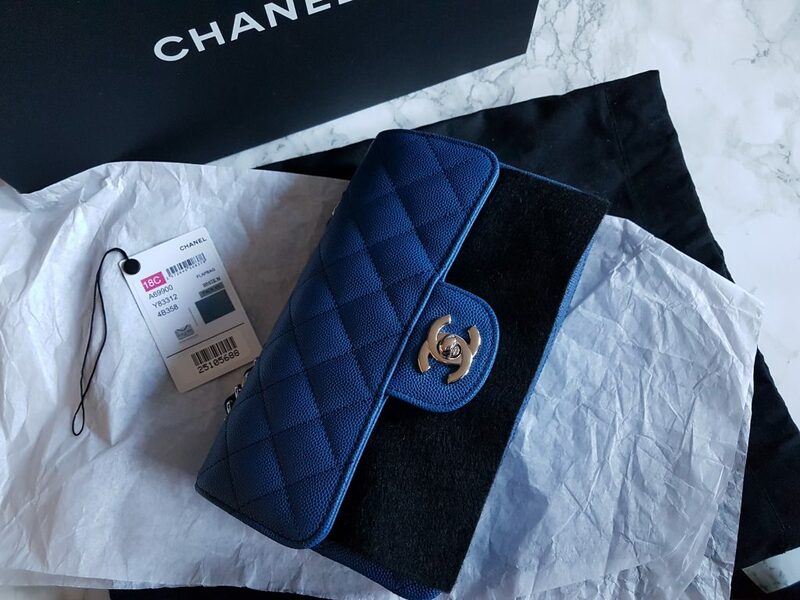 So that was how I decided I really wanted the mini flap – the ideal combination of perfect colour and a size/style I didn’t yet have in my collection. 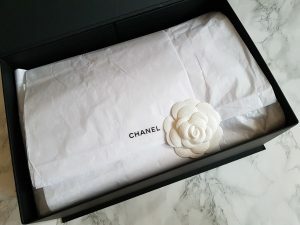 It comes in what looks like a shoebox with a magnatic flap closure, beautifully wrapped in the Chanel ribbon and their signature white camellia flower. Inside has a good amount of tissue padding to protect the bag. 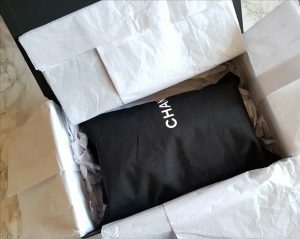 It comes in a black dust bag (to store the bag in when not in use). 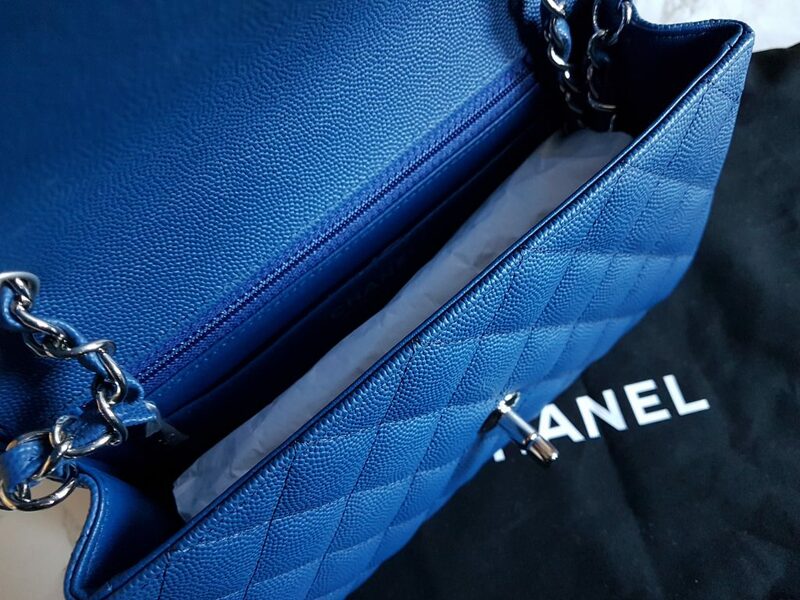 It also comes with the care booklet on how to look after your bag, in addition to a white microfibre care cloth that is standard with Chanel bags so you can clean the hardware and buff out the leather. 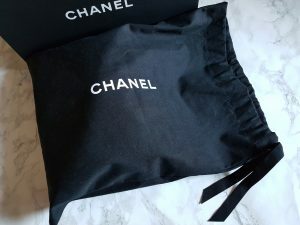 It has a black felt protector that fits under the flap, in addition to tissue stuffing inside the bag which wraps up the chain to prevent it from denting the leather. 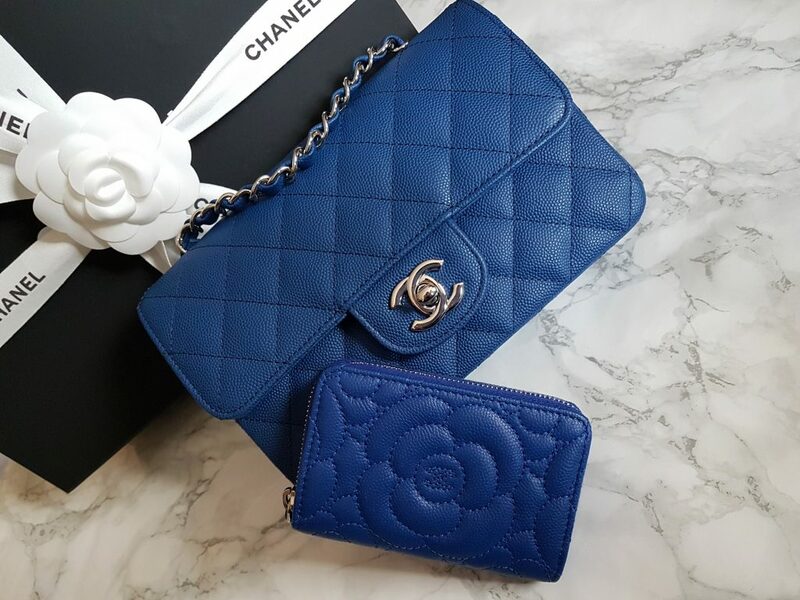 When you think of Chanel classics, the medium/large flap and jumbo come to mind (and to an extent, the less popular small flap). 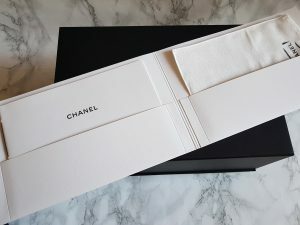 Chanel classics are staples to the brand, that have stood the test of time, and are continually available all year around. 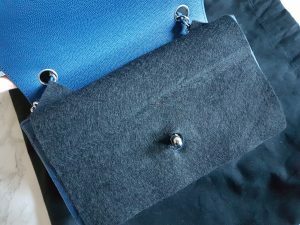 Although the mini flap seems like it, its not considered a classic by the fashion house and so they are harder to come by, especially if you’re looking for a particular colour/hardware combination. 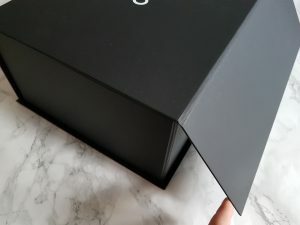 Mini flaps are seasonal and so they come out in a few different colours each season, so if you’re looking for that black mini, then it might be quite a wait until it next comes back around. 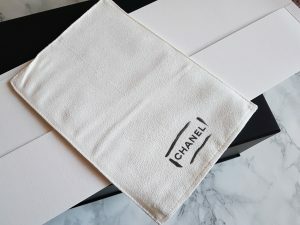 They are also very limited in supply and Chanel don’t do waiting lists (at least not in the UK), so if you see one you like grab it while you can. 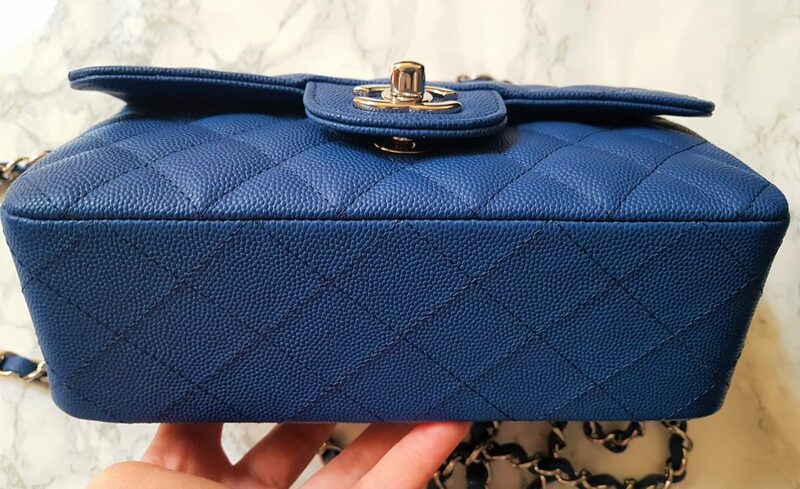 I was lucky that I discovered the rectangle mini flap during the 2018 Cruise Collection (from Nov ’17 – Feb ’18 – between the Fall/Winter and Spring/Summer collection), which had 2 absolutely irresistable colours that I fell in love with. There are also two types of rectangular mini flaps in regards to stitching and the 18C collection had both. Some colours had the edge stitching (which mine has), and others had no edge stitching. I prefer the former because it just looks more ‘finished’ and complete to me. 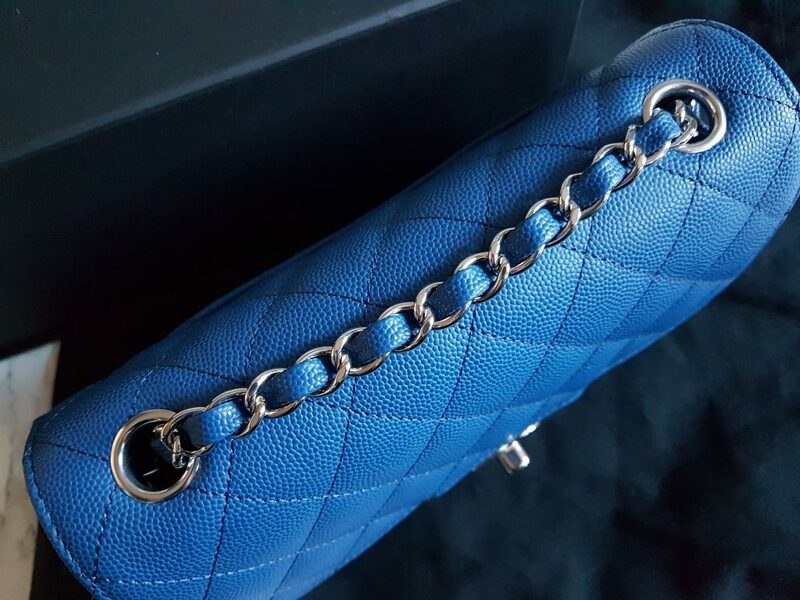 The dimensions/size of the bag is: 20 x 13 x 5 (in cm) and 8″ x 5″ x 2″ (in inches). 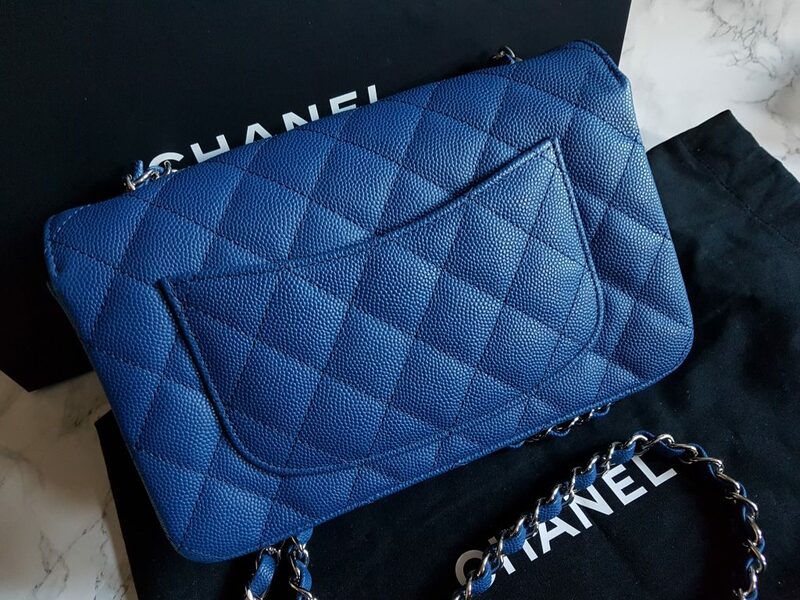 There is also a square mini flap (also seasonal), but I like the look of a classic rectangle shape, and the square seems like it would be more difficult to put stuff in (it may not necesarily hold less than the rectangle, but you would have to stack things on top of each other which makes taking things out a bit of a pain). I prefer a wider surface area, width-wise. A big selling point for me is that the mini only has a single flap compared to the double flap on the classics. I can see a double flap annoying me over time and I’ve heard that it limits space to the point that it doesn’t fit that much more than the single flap mini. 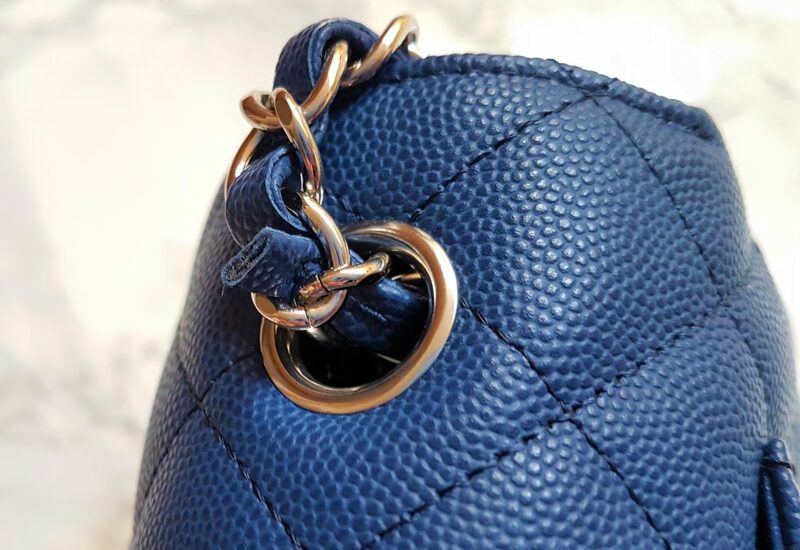 Another difference is that the mini has 2 grommets at the top of the bag as opposed to 4, so the chain doesn’t double up to be worn over the shoulder like the medium large. 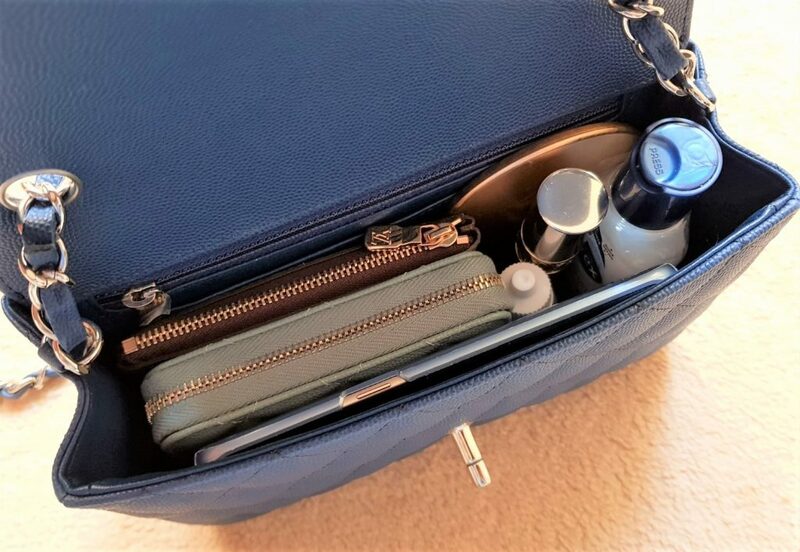 The mini has a longer strap though which makes it really good to wear as a crossbody on most people (probably too long if you’re under 5ft 1in). 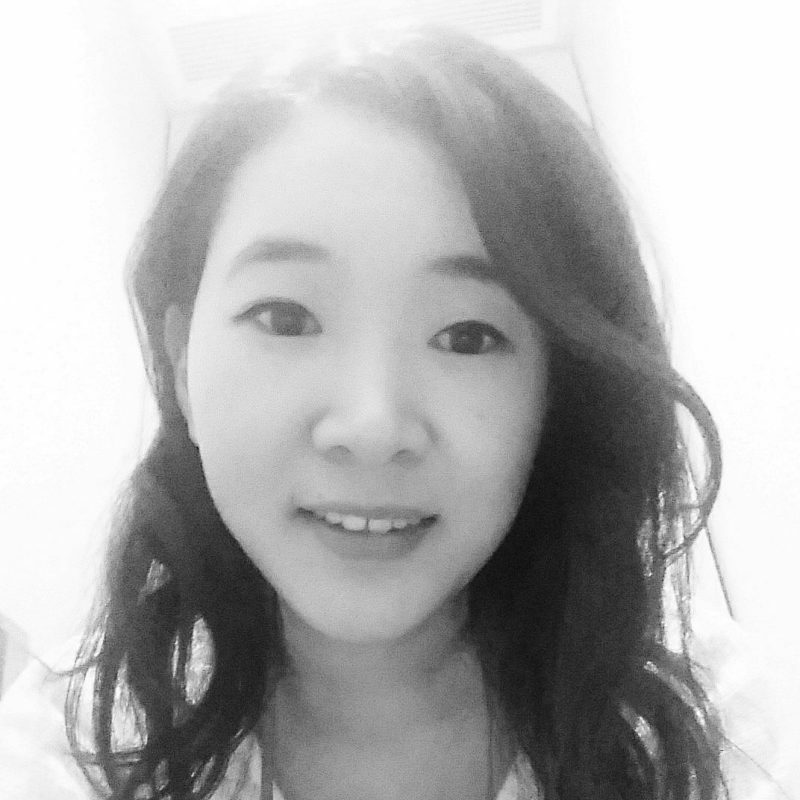 Strap length can vary between different season’s mini flaps but typically I believe they are between 21-23 inches. I’m 5ft 4in, and as a crossbody it hits me just below the hipbone, but I wouldn’t have minded if it was a couple inches higher up. I could get away with wearing it as a normal long shoulder bag, it but it hits mid thigh which is too long for my liking. 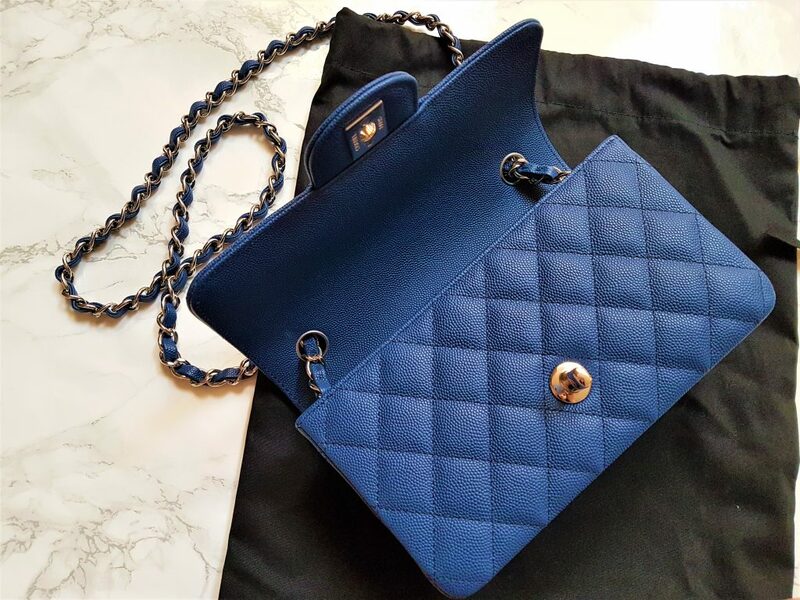 What I love about the mini is that even with 2 grommets, the bag is versatile in the way you can wear it if you play around with the chain. 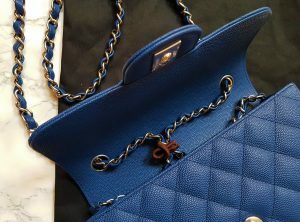 You can loop the chain under and around the top flap for a shorter shoulder bag close under the arm (like the classic flap doubled up), or cinch them together from both sides to shorten it a little so it hangs at the perfect hip length from one shoulder. I’ve had this bag for about 7 months now and mainly wear it crossbody on the weekends for casual days out. 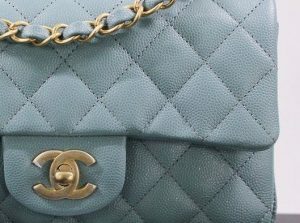 I’ve not had the bag long enough to see major wear and tear and it still looks like new. There are no scratches on the double CC turn lock so far but I’ve left the plastic on the silver underside because I can imagine over time it will develop scratches when you push the flap down to lock it into place and it bumps against the turn lock. I have noticed recently that when the flap is closed, the left corner of the flap lifts up more than the right side. 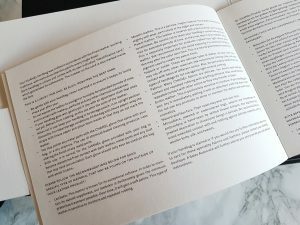 I’m sure it came like that and isn’t something that has happened with use (as I tend to lift the flap from the centre tab and not from the left side) but I’m hoping the disparity doesn’t get worse because things like this do tend to bug me. 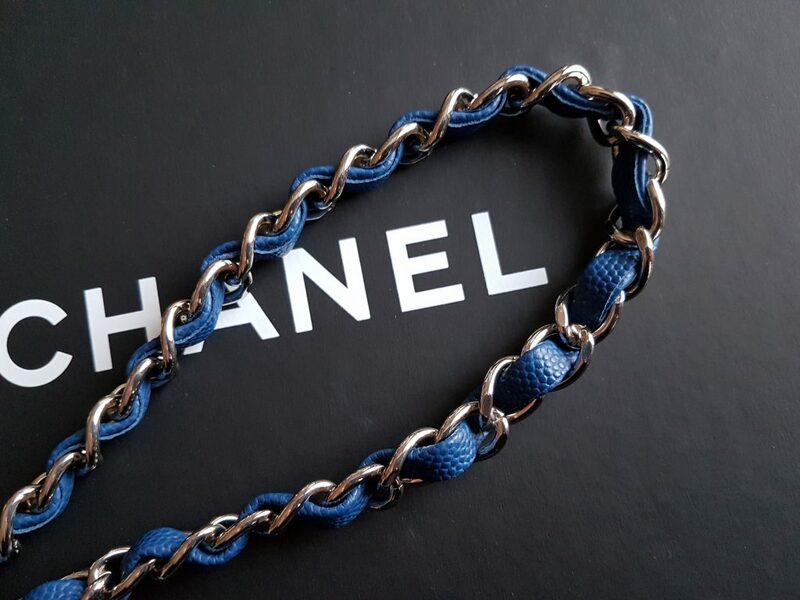 My biggest concern however is the leather woven into the chain. 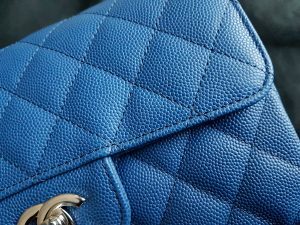 It has a raw, unsealed side of leather which I’m worried may get frayed with long-term use. 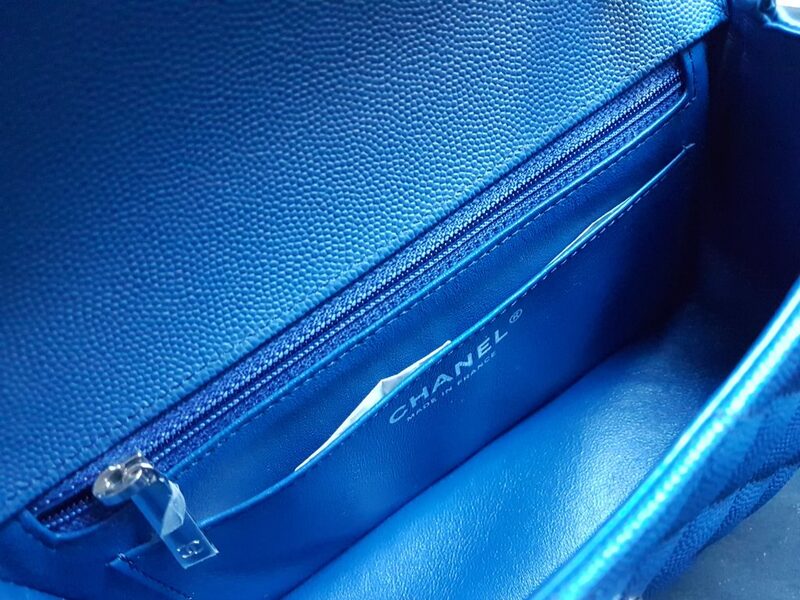 I’ve seen pictures of people with fairly new mini flaps having this problem occur already so it’s not ideal and wish they had made this part more durable but I guess if it comes down to it there’s always the option of the Chanel spa to get it looked at. I’m also not a fan of the ends of the leather strap poking up through the grommets because it looks messy and unfinished to me, but it’s not a big enough deal to warrant much attention. I tend to cram a lot into bags but I make an effort to not overstuff this mini because I don’t want the leather to over-stretch out and lose shape. In particular, the sides of the bag may be more prone to this as they naturally curve inwards; if you continually pack it super full where it pushes out the sides, eventually it will probably not maintain that natural curve. The last thing I want to point out is the mona lisa pocket on the back of the bag. 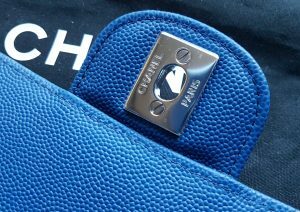 I always really appreciate outer pockets on bags because I like to access things quickly and easily such as my phone, ticket, travel card. The mona lisa pocket is definitely handy for my oyster card or train/cinema tickets but it can’t fit a phone. I don’t worry too much about this pocket stretching out gradually but I try to avoid overstuffing it with bulky things so it doesn’t loosen and have a gaping hole more than it needs to. 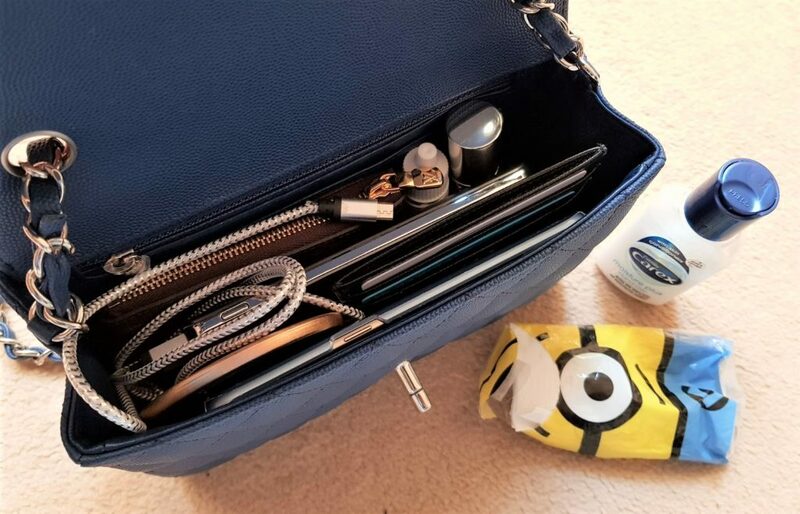 When I first got the mini I wasn’t sure about its practicality because I initially found it difficult to figure out how to pack my stuff within it. I like it a lot more now because I’ve figured out what works for me but I do have one gripe about it and that is its height. 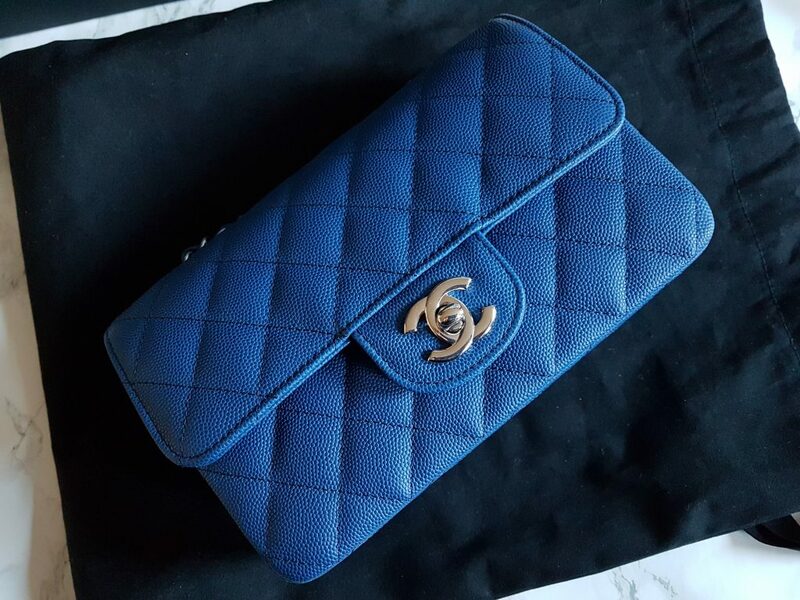 It is 13cm/5 inches tall but I do wish it were slightly taller because most of my SLGs (such as the LV cles and Chanel mini O case etc.) don’t fit vertically. I found myself trying to stack them all upright to maximise space when I first used it but the mini simply isn’t tall enough. The flap will close over them if you do place your SLGs vertically, but then you’re having to tightly force the double CC into the turnlock; also if they’re all stacked on one side then the flap becomes lopsided when closed because your items are pushing up against it. I don’t want it to cause indentations on the inside of the flap so I avoid doing this, but I just wish it were just that inch or so taller. However, the mini can surprisingly pack in a lot of things if you’re able to utilise the space effectively. I usually pack my mini in one of two ways. I always need my phone, wallet and keys (in the LV cles) with me at all times. 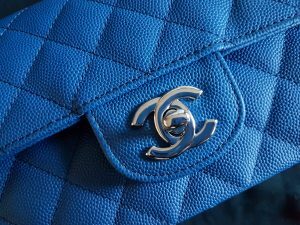 The Chanel zippy coin purse is the largest type of wallet I would put in here. 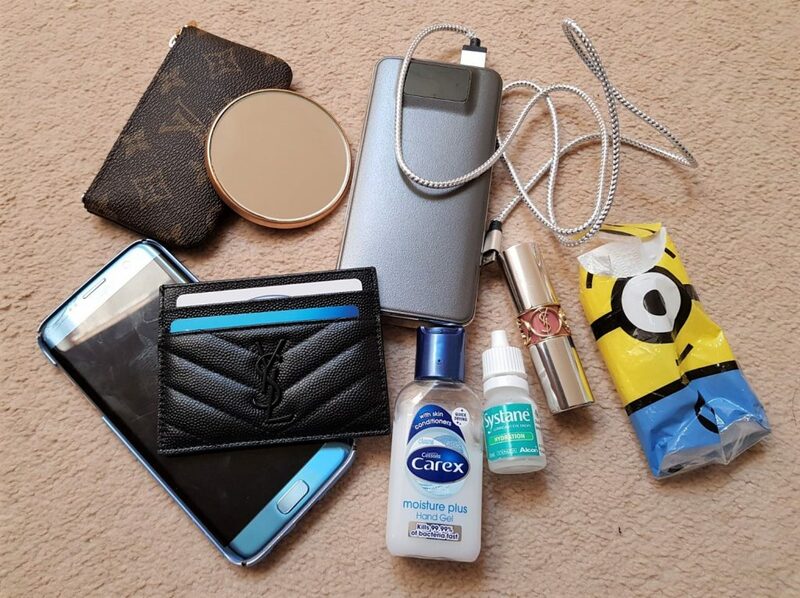 I have the flap card holder with the mona lisa pocket, but I never put that in my mini because its bulk means I wouldn’t have space to carry much else. 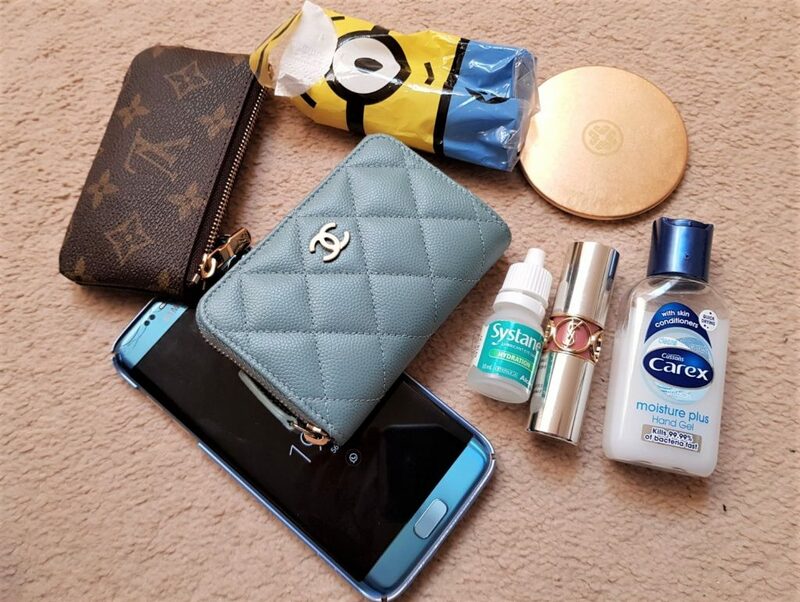 Then I like to have my eye drops, hand gel and packet of tissues, especially if I’m out for the day. With the extra room I can also fit a mirror and lipstick (which I don’t always need but you never know when they may come in handy). If I know I’m going to be out most of the day and my phone battery won’t last, then I pack my bag slightly differently. I bring a power bank charger, and to account for the large size, I will downsize my wallet to a card holder. Everything else stays the same and I simply pop the tissues and hand gel on top of the other stuff before I close it. 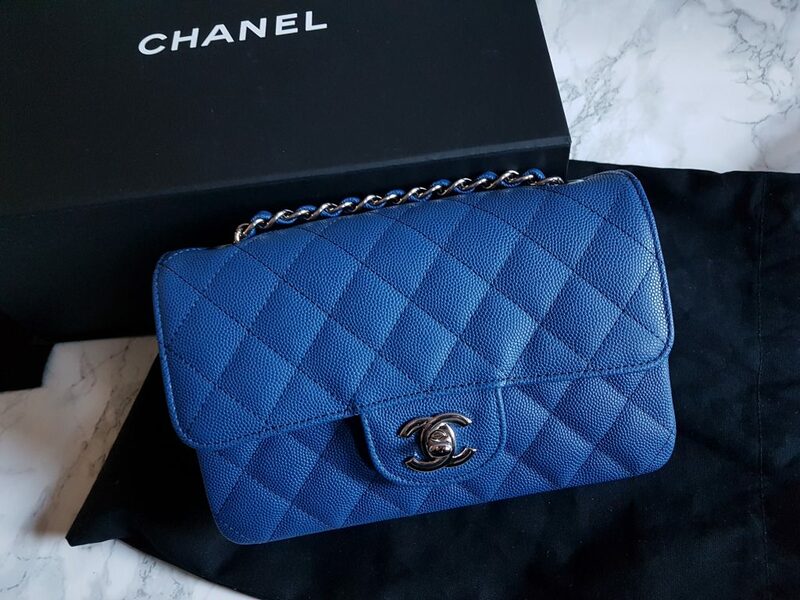 Overall, I really love this Chanel rectangle mini flap and it feels great wearing it. It’s not too heavy even when I pack it full (though you do feel the weight over long hours), it’s quite comfortable on my shoulder and the chain doesn’t dig in like I thought it would. I like how it can dress up an outfit and make you look more ‘put together’, but then the size and colour/hardware combo also ensures I can wear it very casually with jeans, t-shirt and trainers. 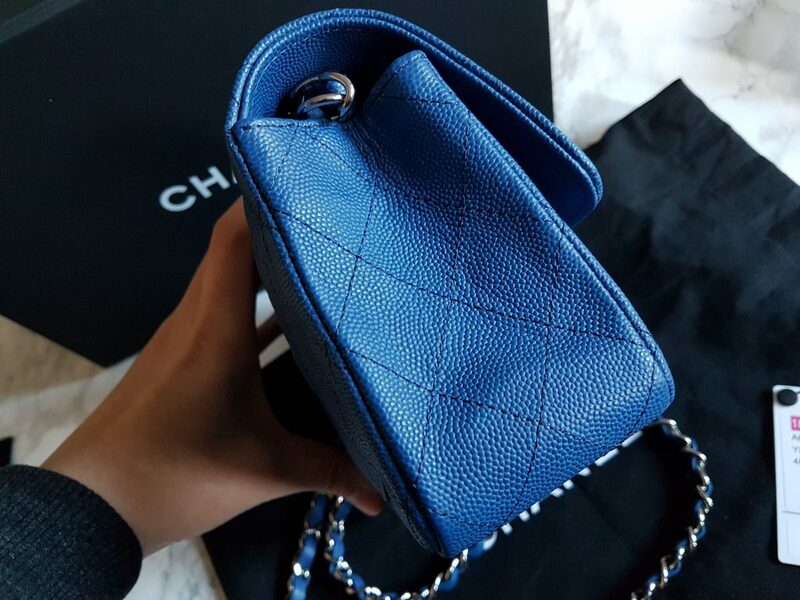 Colour comparison with the blue from Chanel 17S collection – the wallet is more of a deep royal blue whereas the 18C mini is a dark blue but more of a chameleon in different lighting – it can appear much lighter in direct sunlight.